Melrose in possession and on the breakout against Ayr (picture by Dougals Hardie). 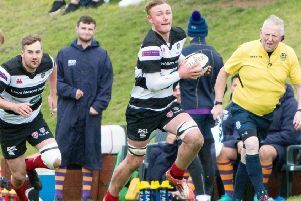 A penalty try after six minutes of stoppage time propelled Ayr into the Premiership Grand Final and ripped away Melrose’s hopes of retaining their championship crown. Ayr will face Heriot’s in the final on April 6. 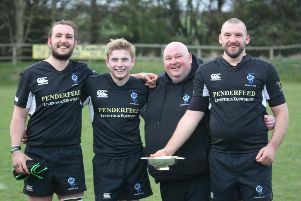 But, before that, Melrose will have another crack at the Millbrae men – this time at The Greenyards – this coming Saturday in the Scottish Cup semi-final, a match certain to be shaped by the closeness and the dramatic conclusion of last weekend. Melrose had their noses in front after a tense, scrappy encounter and tried to hold on in the face of lengthy Ayr pressure near their line before the crucial decision by referee Ben Blain. Ayr took the lead afer two minutes through a penalty from Frazier Climo and Ayr settled into some good form. A try from Grant Anderson was ruled out for a forward pass, while Climo wasn’t so accurate with another penalty attempt from wide on the left, and the hosts were unable to add more points in the first half. An overlap move broke down frustratingly for Melrose before Craig Jackson levelled the scores with a penalty goal six minutes from the break. Melrose crept 3-6 ahead in the second half with another Jackson penalty. The same player added another three points later when Ayr were penalised again. But the home side showed their quality with the game’s only try, scored by Grant Anderson, who later had to go off injured. Jackson stretched the Borderers’ lead to 8-12 with a long-range penalty effort had extended Melrose’s lead to four points with a long-range penalty awarded against Blair Macpherson for playing the ball on the deck at a ruck, after Ayr repeated an offence of playing the ball on the ground. During injury time, Ayr were camped near the Melrose line and made a couple of unsuccessful attempts to get over the whitewash. After a maul spilled across the line, referee Blain declared a penalty try, signalling euphoria for Ayr and anguish for Melrose. Ayr: G. Anderson; R. Tagive, J. Pinkerton, D. McCluskey, K. Rowe; F. Climo, H. Warr; R. Sayce, R. Smith, S. Longwell, D. Corbenici, L. Morrice, B . Macpherson, T. Spinks, P. McCallum. Subs: A. North, R. Curle, O. Smith. Melrose: C. Jackson; G. Wood, P. Anderson, G. Taylor, I. Sim; J. Baggott, M. McAndrew; G. Shiells, R. Anderson, C. Crookshanks, J. Head, C. Young, R. Knott, G. Runciman, I. Moody. Sub: R. Ferguson.